Artist Sari Carel is hoping to install the sound sculpture in May. SUNSET PARK — The sound of Sunset Park’s unseen critters will get the spotlight in a new sound sculpture this summer. 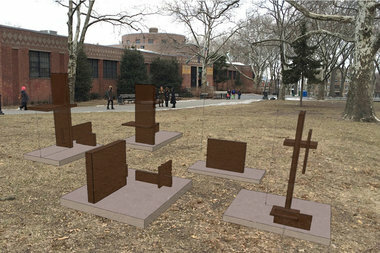 The wooden sculpture, called “Borrowed Light,” was designed by artist Sari Carel and will be installed near the park’s recreational center in May. The artwork also has visible speakers that will play a soundtrack featuring the sounds of birds, bugs and animals that live in the park. “I wanted to elevate these little marginalized semi-invisible animals,” she said. Those critters include beetles, blue jays, raptors, falcons and cicadas, among others, according to Carel, who met with a ranger from the city’s Parks Department to find out which animals live in Sunset Park. Carel, who is working in collaboration with More Art for the project, is creating an “audio collage” that mixes music with ambient sounds from the park and calls of the wild from local fauna through online recordings. (Here's Carel's soundtrack based on the music of the Black Rail). “People can wander through the shapes or sit on them or just hang out on them for a bit and listen to the sounds,” she said. Borrowed Light’s opening reception will be held May 8 and it will be on view until October. Organizers are also planning to host performance art workshops near the sculpture. Borrowed Light currently has a Kickstarter page to help fund the project but Carel is determined to go ahead with the work whether or not the $5,500 goal is reached. Carel, who lives in Bed-Stuy, said she decided on Sunset Park — “this little epitome of nature in an urban environment” — because the park is heavily utilized by locals in the neighborhood. “Sunset Park… has a real sense of community and a texture of the community itself,” she said.